This is my blog, intended to provide information relevant to the history of Edinburgh in the Georgian period. I would love to hear any comments you may have. 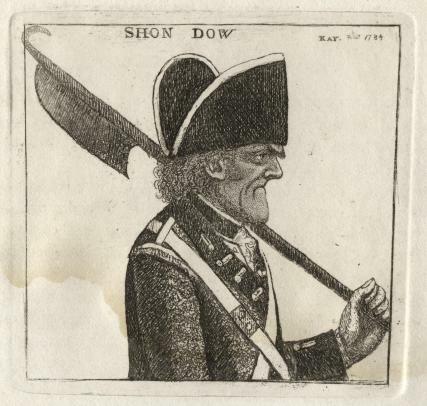 The following obituary appeared in the Gentleman’s Magazine, May, 1795. 'Lord Daer, died of a consumption; at Ivy-Bridge, Devon; and was buried at Exeter. To those unacquainted with his Lordship, it is not easy to convey an adequate idea of his character. Though heir-apparent of a princely fortune, he had never listened to the siren voice, nor tasted the intoxicating cup, of Pleasure. His active mind, eagerly engaged in the pursuits of business, submitted with impatience to that repose which was necessary to preserve its vigour. Nothing could equal the felicity with which he conceived the ardour with which he pursued, and the judgment he displayed in accomplishing, the multifarious objects which occupied his attention, Of every subject which had fallen under his notice he had a complete and thorough acquaintance; and, as the sphere of his observation was enlarged, his knowledge was not only accurate but extensive. In that public business, which more immediately concerned the two counties in which his father’s estate was situated, his Lordship had a large and important share. His zeal and fidelity in the discharge of every public duty secured the esteem and approbation of all. In tracing out the line of’ a. new road, or improving the direction of an old one, the ability of his Lordship was unrivaled. Of his superiority in this respect, the counties of Wigtown and Kirkcudbright afford many decisive monuments. Lately on his way to the island of Madeira for the recovery of his health, in the 29th year of his age, Basil William Lord Daer, eldest son of the Earl of Selkirk, and late a member of the Edinburgh Convention. 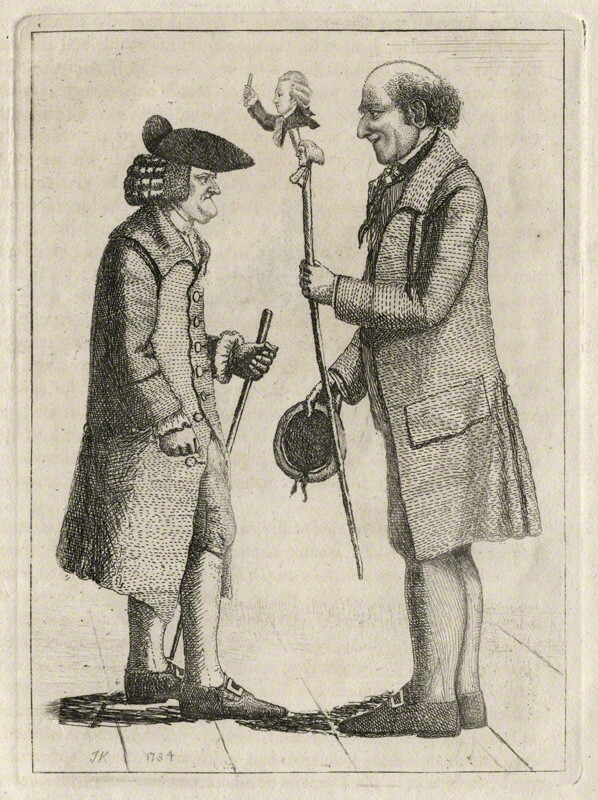 John Kay (1742-1826) was a Scottish caricaturist and engraver of striking originality whose quirky observations offer insights into the culture of Edinburgh in the Georgian period. The city certainly seems to have had no shortage of eccentric characters, and this blog has already featured a few. 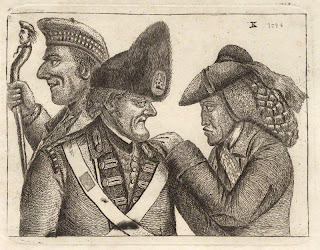 Pictured below is his engraving 'Three Edinburgh Bucks' showing three well-known Edinburgh 'worthies', The Daft Highland Laird, John Dhu, and Jamie Duff. The figure on the left holding a walking stick topped by a carving of his own head is James Robertson of Kincraigie, better known locally as The Daft Highland Laird. This gentleman was said to have gone mad whilst incarcerated in the Tolbooth as a supporter of the Jacobite cause, and he was released when the authorities decided he was harmless. Supported by a grant from his family, he lived on in Edinburgh until 1790. One of this man's eccentricities was to carve a series of walking sticks featuring the heads of well-known local people. In the caricature below Kay portrays him showing a stick with two such heads, those of James Graham (a quack doctor) and Edinburgh University's Principal Robertson, to one Dr Glen, who seems little impressed, it has to be said. In the 'Three Edinburgh Bucks' engraving (top image) the figure in the centre is John Dow or Dhu, Corporal of the Edinburgh Town Guard. This organisation was the only means of policing in the city during the eighteenth century and was comprised mainly of veteran highlanders retired from the military. They were equipped with muskets by day and halberds (see another Kay depiction of John Dhu below) by night. Sir Walter Scott described John Dhu as one of the fiercest-looking fellows he had ever seen. Despite their ferocious aspect and formidable weaponry, apparently the Town Guard were the object of widespread ridicule. It cannot have helped their effectiveness that many of the Town Guard could speak only Gaelic. The formation of a city police force in 1805 rendered the Town Guard obsolete, and they were disbanded. In the 'Three Edinburgh Bucks' engraving the figure on the right is that of Jamie Duff, another local eccentric and street-dweller. Known far and wide as Daft Jamie, the most conspicuously unusual aspect of this character was his obssessive habit of 'crashing' funerals. Scottish funerals were very often occasions when, after the deceased was laid to rest, whisky was imbibed, and it may be surmised that Jamie was perhaps not quite as daft as many believed. According to one contemporary "no solemnity of that kind could take place in the city without being graced by his presence... by keeping a sharp look-out for prospective funerals, Jamie succeeded in securing almost all the enjoyment which the mortality of the city was capable of affording." ¹ Another nickname Jamie enjoyed was Baillie Duff, referring to the mock chain of office he sometimes wore on the streets; a baillie was a civic officer in Scottish burghs, and perhaps Jamie felt that his brass chain elevated his lowly status. Below is another Kay engraving of this man, who died in 1788. The title of this post is mischevious, as of course Scotland did not become a republic at any time. However, in the late eighteenth century there were many Scots who desired that political outcome, and the man they wanted for their first president was Thomas Muir of Huntershill. 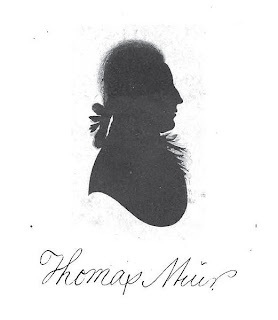 Thomas Muir was born in Glasgow in 1765, the only son of a successful merchant. He was afforded the best education that was available, and after matriculating at Glasgow University at the age of twelve he took up a study of Divinity. He graduated M.A. in 1782 aged seventeen, and subsequently came under the influence of John Millar of Millheugh, Professor of Civil Law. The next year, abandoning Divinity, he was accepted as a student in Millar's classes on Law and Government. John Millar deserves far wider fame today than he enjoys. A pupil of Adam Smith, David Hume and Lord Kames, he was regarded in his day as Scotland's supreme public lecturer, and this in an age where Scotland did not lack men of genius. In politics Millar was a Republican Whig and one of the most scathing critics of the so-called ‘benevolent despotism’ of Henry Dundas. His profound influence on the young Thomas Muir is quite evident. The young Muir's fiery democratic leanings first came to notice in 1784, when Muir excluded himself from the University on principle, over the mistreatment of an esteemed member of staff. At the beginning of the new academic year, Muir with the assistance of Professor Millar, obtained a place at Edinburgh University under the Whig Professor of Law, John Wylde. Here he completed his studies and having passed his Bar examinations was admitted to the Faculty of Advocates in 1787 at the age of 22. After championing his local congregation in Cadder, who resented the efforts of the local landowner to install his own choice of minister, Muir acquired a reputation as a 'man of the people', a man of principle who would willing adopt the cause of the underdog against the powerful elites in Scotland, especially those within government. The year 1789 saw the outbreak of the French Revolution, and Thomas Muir like so many Britons of a liberal persuasion had great hopes that in time all of Europe's monarchies would follow the course first established in America and become popular democracies. Clubs and societies were born across the country to promote the cause of political reform, and a broad-based movement was established. In Scotland, Thomas Muir helped to draw up a framework for an umbrella organisation to bring these groups together, and in July 1792 the Scottish Association of the Friends of the People was born. On the 21st November, Muir, having been elected Vice-President of the movement at the Edinburgh monthly meeting, called for a General Convention of the corresponding societies of England and Ireland to be held there in December. This development troubled the British government deeply; the Edinburgh General Convention was seen as a direct threat to the established order in Britain. Government spies were directed to penetrate the proceedings, and only days after the Convention closed Thomas Muir among others was arrested on a charge of sedition. Muir refused to answer the officiating magistrate's questions and was bailed, and then journeyed to London to report on the plight of the Scottish radicals to their colleagues there. It was at this point that word arrived of the planned execution of Louis XVI, and Muir agreed to journey to Paris as part of a delegation aimed at dissuading the French revolutionaries from their course. Arriving too late to prevent the king's death, Thomas Muir was nevertheless welcomed and toasted by the leading members of the Convention. 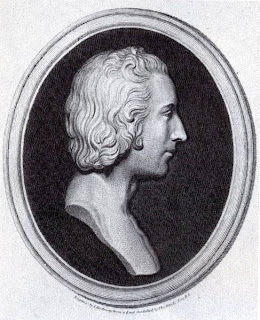 Word of his whereabouts had obviously reached the Scottish Lord Advocate, Robert Dundas, for Dundas now forwarded the date for Muir's trial by two months, making a timely appearance impossible for him. On his return to Scotland he was arrested at once, and became the principal victim of a series of show trials in Edinburgh that became notorious examples of the political abuse of the judicial process. Before the Scottish version of Judge Jeffries, the cynical Lord Braxfield, and a carefully chosen jury of fervid anti-reformers (their selection was possible under Scots law), the outcome of the trials were never in doubt. Muir's crime was that he had dared to suggest that there might be ways to improve the British system of government, namely by widening the franchise to include men of less privileged classes than Braxfield's own. Muir's eloquent and thoroughly convincing defence was dismissed, and he was sentenced, with others, to fourteen years deportation to New Holland, virtually a death sentence at that time. In a disgraceful show trial in Edinburgh in 1794, Thomas Muir was found guilty of the charge of sedition and sentenced to fourteen years transportation to New Holland. Muir was moved temporarily to a Royal Navy vessel, for fear of attempted rescue, before being sent on to the notorious prison hulks at Woolwich and then the even more infamous Newgate. In May he and other Scottish radical 'martyrs' were embarked upon a vessel named 'Surprise' (no, not that one) and sent on the six month voyage to Australia. Arriving in reasonable health, Muir managed to avoid the worst of the dreadful conditions there by obtaining a small holding of land away from the main colony, where disease carried so many away. 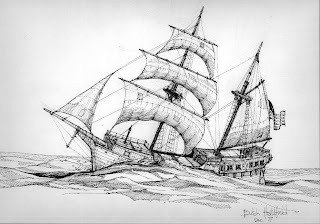 Muir did not lack supporters worldwide, and his status enabled him to escape in February 1796 by boarding an American trading vessel, the 'Otter'. It is sometimes speculated that the Otter's presence at new Holland was no coincidence, and even that it was there on President Washington's express instructions. Whilst there has been no evidence found to support these claims, it is certainly true that the vessel's master, one Ebenezer Dodd, put himself at risk in taking him away. 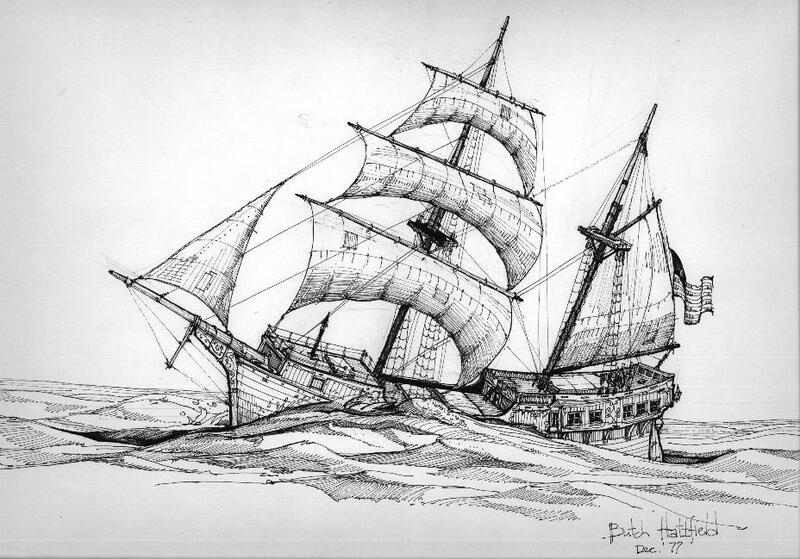 A Royal Navy frigate, from which the slow-sailing Otter would not have been able to escape, was at nearby Port Jackson. Muir's escape and subsequent adventures read like something from the pages of Forrester or O'Brian. By night, Muir and his two convict servants paddled a dinghy silently past the frigate, under the noses of the watch, and then at length to the Otter. A long voyage across the Pacific followed, to Nootka Sound near Vancouver Island, an area then claimed by Spain. Encountering a Spanish vessel there, Muir learned from her captain that another Royal Navy vessel, the Providence, was in those waters, actively searching for him. He persuaded the Spaniard to take him aboard, and arrived eventually at Monterrey in Mexico, then another Spanish possession, where the Governor welcomed him and housed him in his own palace. However, Muir's request to be permitted to pass through Spanish territories to the United States was turned down by the Viceroy, who no doubt feared creating an international incident. Instead, he was led away to Mexico City, where he was detained under guard. The Viceroy decided at length to send Muir to Spain, so that the responsibility for any decision made would not be his. Muir reached Vera Cruz on Mexico's east coast in October 1796, and was taken to Havana, Cuba, to await transportation. Here he attempted to escape into the hands of visiting American ships, but was discovered and imprisoned in the dungeons of the military fortress for three months. Eventually he was put onto a Spanish ship, the Ninfa, bound for Cadiz in Spain. Reaching that port in March 1797, it was discovered that it was being blockaded by a detachment of British men o' war, who quickly confronted the Ninfa. After a three hour chase, during which a companion Spanish ship was deliberately scuttled in order to avoid its cargo of bullion falling into British hands, Muir's vessel was forced to turn and fight. The Ninfa was badly damaged in the battle and was forced to strike its colours, and in the action Muir was severely wounded by a cannonball which shattered his face and damaged both his eyes. The British ships, learning of his presence, hunted for Muir among the survivors, but perhaps because of his injuries he was not recognised and he was allowed ashore with the other wounded seamen. Thomas Muir was put ashore at Cadiz in April 1797 and spent months languishing there, awaiting word from the Spanish authorities on his fate. Eventually, in September, they acceded to representations from the Directoire that he be allowed to travel to revolutionary France. Weakened by his injuries, he journeyed overland via Madrid, reaching Bordeaux in early November. His arrival there was celebrated with great enthusiasm, for by now news of his survival after so many adversities had reached the radical liberals and democrats of Europe, who hailed him as a 'Hero of the Revolution'. He reached Paris in the following February, where public acclaim and celebrations reached new heights. When word of Muir's arrival in Europe reached Scotland, the effect in his homeland was electrifying. By now the Scottish radicals, and especially the virulent and growing clandestine radical organisation the United Scotsmen, had come to regard him as their movement's most prominent and able leader, and their most famous martyr. 1797 was the year the Scottish radicals conspired with the republican leaders of Europe in a scheme that might have changed European history had it come about. The plan was for nothing less than the landing of 50,000 troops of the Batavian Republic in lowland Scotland. The Dutch fleet assembled in the Texel was ready to transport them, and with the Royal Navy in disarray at that time, the subject of mutinies at the Nore and Spithead, there were high hopes of their getting across the North Sea to the Firth of Forth. The troops were to land and seize the capital, initiating a general rising across Scotland, a very realistic prospect with the Militia Act of that year creating outbreaks of resistence in even the country districts. The United Scotsman planned to create a Scottish Republic with Thomas Muir as its first President, and the Revolution would be carried into Ireland and then England thereafter. Bad weather delayed the scheme, and in the event the Royal Navy under Admiral Duncan defeated the Dutch fleet, against all the odds, at the Battle of Camperdown in October 1797, and the invasion plans were placed on hold. Learning of the strength of radicalism in Scotland after reaching Paris, Muir began consulting with Scottish exiles and emissaries there. However, his health had never recovered from the devastating injuries he incurred off Cadiz. He fell into decline, and died suddenly in Chantilly on 26 January 1799, alone in his cottage whilst awaiting his political colleagues. 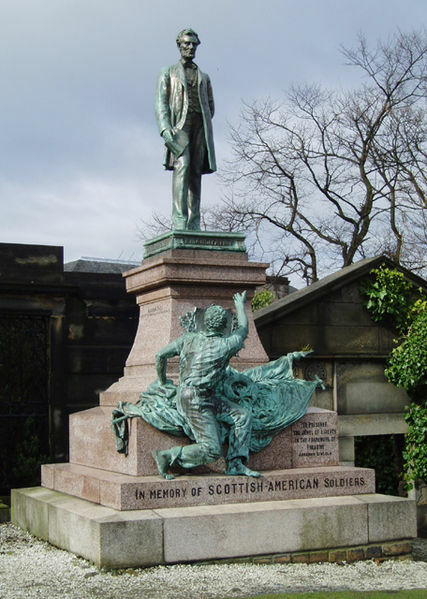 A monument to Thomas Muir and the other Scottish radical 'martyrs', so notoriously victimised in a series of rigged show trials in the 1790s, was erected in the Calton cemetery in Edinburgh in 1844 and can be seen there today. The other men celebrated there are Thomas Fyshe Palmer, William Skirving, Maurice Margarot and Joseph Gerrald. Calton was a village lying on the western slopes of Calton Hill in what is now central Edinburgh. Before 1718 its villagers buried their dead at South Leith Parish Church, the only graveyard available to them and some 3km distant. In that year half an acre of ground close by the village was purchased from feudal superior Lord Balmerino by the Society of the Incorporated Trades of Calton to create a graveyard, and this was gradually expanded throughout the eighteenth century. In the early nineteenth century Edinburgh was growing and developing rapidly. A new road, named Waterloo Place after the contemporary Allied victory, was built between 1815 and 1819 which cut through the graveyard, forcing the removal of graves and human remains to the New Calton Cemetery a short distance to the east. Perhaps surprisingly, this process was carried out with some sensitivity, the remains being carefully extracted and wrapped before reburial and many of the larger headstones relocated. 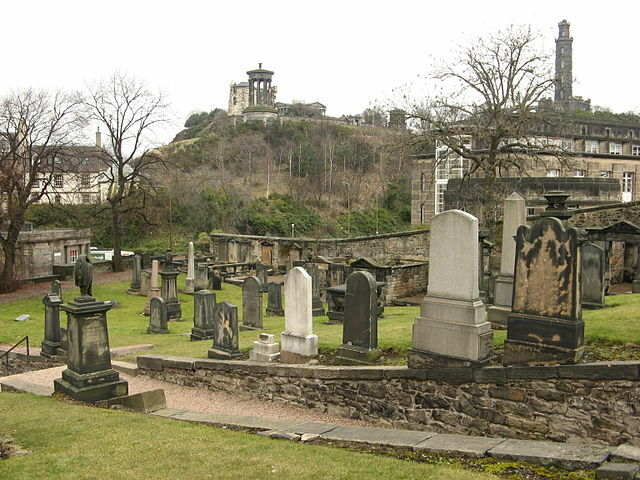 Today a small section of the Old Calton Cemetery remains on the north side of Waterloo Place, cut off by the new road, and many of the older headstones survive in the main part. The cemetery has been closed to burials since 1869, but it is now in the care of the City of Edinburgh Council and is permanently open to the public. It is perhaps not the safest place to visit after dark (being at those hours the frequent refuge of various somewhat antisocial types!) but a daylight visit is recommended as full of historical interest. 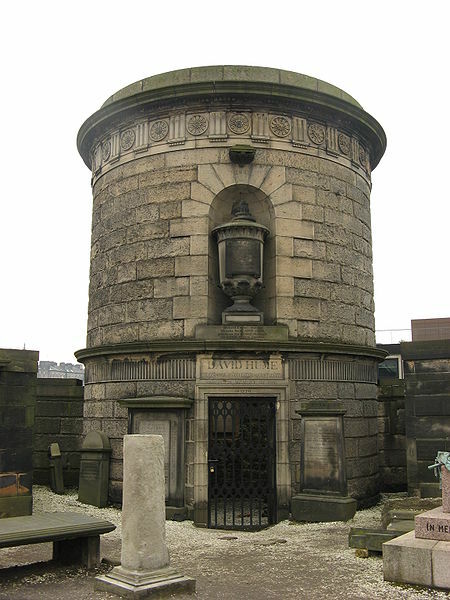 Among the memorials you will find those of the philosopher David Hume, the publisher William Blackwood, civil engineer Robert Stephenson, actors Charles Mackay and William Woods, architect John Burn, clergyman Dr Robert Candlish and mathematician John Playfair. 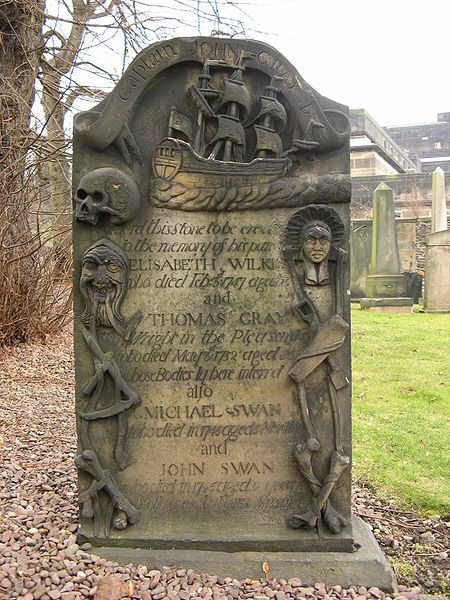 One of the most interesting stones is that of Captain John Gray, erected about 1760 in memory of his parents. It is inscribed with his name and then a carved anchor, beneath which is a carving of a 3-masted ship, flying the ensign, shown in bold relief. Down the left side of the stone is a skull and bearded, male head wearing a cap (his father). From the mouth spill two ribbons, that link symbols of death: a scythe crossed with another implement (not recognisable) and crossed bones. Down the right side is a female head, wearing a bonnet (his mother). Ribbons from the bonnet link again to symbols of death: a spade crossed with a coffin, and again crossed bones (specifically thigh bones). An impressive memorial to the Scottish-born fallen of the American Civil War, crowned by a bronze statue of Abraham Lincoln, stands in a focal point in the graveyard. This was erected in 1893, the first statue of an American president erected outside of the United States. Of even more interest to this blogger however is the monument to the Scottish political martyrs Thomas Muir, Thomas Fyshe-Palmer, William Skirving, Maurice Margarot, and Joseph Gerrald. These men were sentenced to be transported to the New South Wales penal colony in 1793 for daring to express their political beliefs. Their crime in the eyes of the judges was advocate universal suffrage, and the rights of the common man to control his destiny, i.e. voting rights for all, not just landowners. 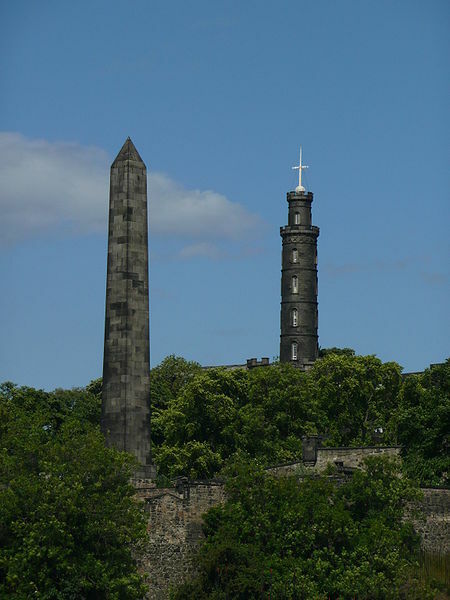 Most of these men did not survive their exile, which at that time amounted to a death sentence, and the injustice dealt to these men by a Scottish court was recognised by the Friends of Parliamentary Reform in England and Scotland who built this huge obelisk in 1844. For more on the Scottish political martyrs, especially Thomas Muir, see earlier posts on this blog. "Robert Watt, convicted of high treason, was executed at the west end of the Luckenbooths, pursuant to his sentence. About half past one o'clock, the two junior Magistrates, and the Rev. Principal Baird walked from the Council Chambers to the Castlehill, preceded by the city constables, and town officers, and the city guard. When they reached the Water-house (the limits of the burgh), they were met by the procession from the Castle, which was in the following order: Two Chief Constables of the shire of Edinburgh, in black, with batons, two county constables, with batons. The Sheriff-Depute and Sheriff-Substitute, dressed in black, with white gloves and white rods. Six county constables, two and two, with batons The hurdle painted black (drawn by a white horse), in which were seated the executioner, dressed in black, with the axe in his hand, and the criminal drawn backwards, and tied to the hurdle. Six under constables on each side of the hurdle - twelve on the outside of them, and twenty in the rear. Two hundred of the Argyleshire fencibles keeping off the mob, walking the dead march from the Castle to the Water-house." "Having entered the Tolbooth, the criminal, soon after, attended by the Sheriffs and Magistrates, came out upon the scaffold, where he was assisted in his devotions by Principal Baird. About a quarter before three, he ascended the platform: but craving some longer indulgence, he came down, and kneeling, prayed with much fervency, for a short time, when he again mounted, and having dropped a handkerchief as the signal, the platform dropped, about three o'clock." "When the body had hung about thirty-two minutes, it was cut down lifeless, and placed on a table The executioner then came forward with a large axe, and in two strokes severed the head from the body. The head having been received in a basket prepared for the purpose, was afterwards, in the usual form, held up by the executioner, who pronounced 'This is the head of a traitor.'" "This execution was conducted with much regularity, and the procession in particular was highly solemn and impressive. Watt himself exhibited a picture of the most abject dejection. He was wrapt (sic) up in a great coat, a red nightcap, which on the platform he exchanged for a white one, with a round hat, his stockings hanging loose, and his whole appearance wretched in the extreme The croud (sic) on this occasion was slow in collecting, and though numerous at last, scarcely amounted to what has appeared at former remarkable executions." 1. 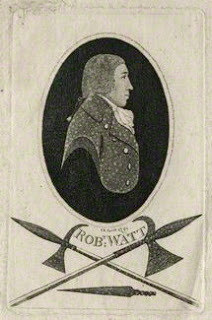 For a fuller account of Watt, see the blog post "Robert Watt: radical or government spy?" below, dated 28 March 2012. 2. The Scots Magazine, January 1794. Following the political settlement of the Act of Union in 1707, Scotland lost its political identity whilst retaining only three social institutions that distinguished it from the rest of Britain; church, law and education. In political terms Scotland after 1707 was run very much as a county of England, with a representation in parliament less than that of Cornwall. Yet the particular problem posed by Scotland was understood well at Westminster, and during the eighteenth century the running of the country was effectively devolved to an oligarchy of law lords, and at times even to a single man. 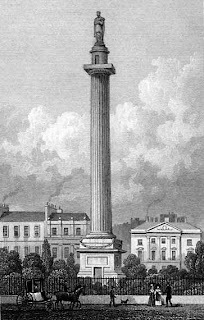 Under the premiership of William Pitt the Younger this supreme power fell upon Henry Dundas, created Viscount Melville in 1804. For over thirty years this man held all political power in Scotland, and all office and preferment came through him; judges, senior legal offices, sheriffs, Customs and Excise officials, university professors, and clergy all held their places through his approval. In this period Dundas was familiarly known in his fiefdom as 'Harry the Ninth'. 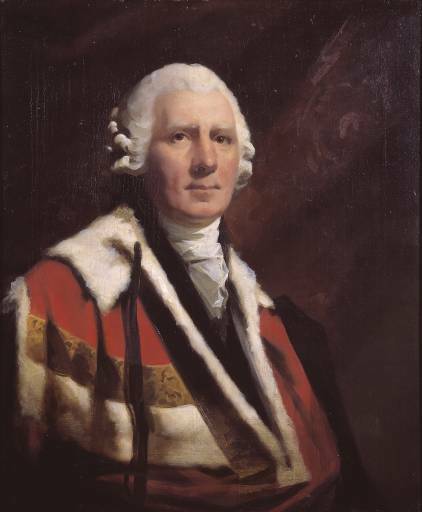 Henry Dundas was born in Dalkeith, Midlothian in 1742, the fourth son of Robert Dundas, Lord President of the Court of Session. The Dundas family had already held senior judicial and political offices for some generations; Henry's great-great-grandfather Sir James Dundas had governed Berwick-Upon-Tweed under King James VI and I. Henry's early career was conventional for his status and times. He attended the Royal High School and Edinburgh University, became a member of the Faculty of Advocates in the city in 1763 and then through family influence was appointed Solicitor General for Scotland in 1766. However his legal career was largely relinquished after his appointment as Lord Advocate in 1775. The Dundas family were high Tories, and under the political system of the day Henry as Lord Advocate had no trouble running Scotland exactly as the Tory leadership desired. The franchise was restricted to males of a certain established income (Scotland's electorate remained below 5,000 until the Reform Act of 1832), and it was not difficult to ensure that all Scottish MPs would toe the family line. During this 30 year reign 'King Harry' held a number of political appointments, beginning with Member of Parliament for Midlothian in 1774. He was a loyal supporter and close confidant of Pitt the Younger, becoming Home Secretary in 1791, War Secretary in 1794, and First Lord of the Admiralty in 1804. However, suspicion fell upon Dundas in his role at the Admiralty, and he was impeached in 1806 for the misappropriation of public monies. Although the result was an acquittal, Dundas never again held public office. 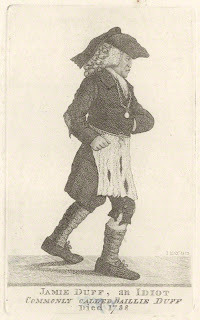 He had been begging Pitt for some years to be allowed to retire on health grounds, and died in 1811 aged 69. A monument to Dundas, loosely modelled on Trajan's Column in Rome, stands in the centre of St Andrews Square in Edinburgh, completed in 1828. ¹ Lady Minto to Lord Minto, 30 May 1806, Life & Letters of Gilbert Elliot, 1st Earl of Minto, from 1751 to 1806 (London, 1874), III, 383f. Eighteenth century Edinburgh was late in welcoming the theatre, considering its worldwide reputation even then as a centre for learning and the arts. 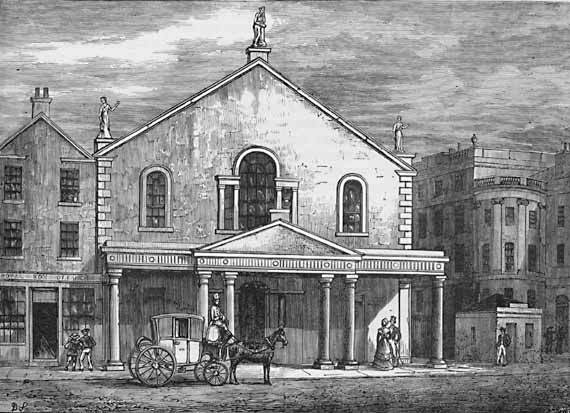 Early attempts to stage dramatics within the city's limits fell foul of the authorities, spiritual as well as temporal, as theatre was considered by the Church of Scotland as a low, immoral enterprise likely to lead towards sin. It was not until 1767 that permission was granted to an actor/manager named David Ross to erect a purpose-made venue in the aptly-named Shakespeare Square at the eastern end of Princes Street. This building was eventually demolished in 1859 to make way for the new General Post Office (now Waverley Gate, home of Creative Scotland), but in the ninety years of its life the Theatre Royal played a central role in the society of Georgian Edinburgh. And 'twas a sin - to view this glass of life! And tragic greatness fear'd the scourge of law. David Ross lacked the financial resources to stage plays in the style then current in London, but his successors gradually built a large and appreciative theatre-going public. Samuel Foote showed the potential on 1770 by making over a thousand pounds in a single winter season, despite vast expenditure on scenery and high quality actors. Thereafter the theatre's long-term success was assured, though not all visiting Thespians found the audiences easy to win over. 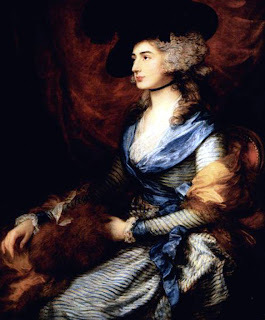 In May 1784 the darling of London audiences, Sarah Siddons, made her first appearance on the Edinburgh stage. 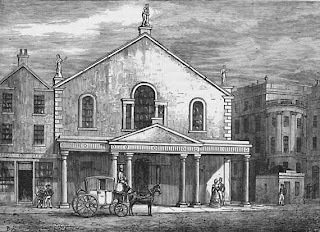 In 1794, at the height of the political turmoil generated by the French and American Revolutions and the rise of popular democracy, the Theatre Royal became the venue of scenes that staid Edinburgh had not seen since the Porteous Riots of 1736. A performance of a play titled King Charles the First (probably based upon Perinchief's hagiographical work) was interrupted when a group of hecklers began hissing any sentiment in favour of the monarchy and wildly applauding any that opposed it. At length some others in the audience caused the theatre band to play the national anthem, thus requiring everyone present to stand bareheaded. The hecklers would not comply and though they were at length ejected, for several successive performances the theatre was attended by large numbers of political radicals and revolutionaries, some of them apparently Irish medical students; the United Irishmen were then on the ascendancy, and a similar organisation was in the process of taking root in Scotland. There to meet them were similarly large numbers of constitutionalists and Tories, also armed. 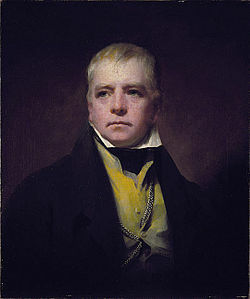 One of the latter was the young advocate Walter Scott, still with no idea of his destiny as a novelist, who was directly involved in the brutal fighting which took place in the theatre on the Saturday of the final performance, in which many men were injured and which continued for some time in the street outside. ¹ Cockburn, Henry, Lord, Memorials of his Time, Edinburgh, 1874.